I saved this recipe for the weekend as it seemed like appropriate fare for an end of week dinner with the family. Jamie Oliver has a section in his book with various marinades and rubs, and for this recipe I had to marinate the pork chops in a Rosemary, Garlic and lemon marinade. I did this in the morning and left it in the fridge. I did adapt this recipe as the original recipe uses a lot of olive oil, I added more lemon for lubrication. My version can be found here..
Then, 45 minutes before you are ready to eat, you quarter some parsnips, some pears and some potatoes – all with their skin on, put them in the roasting tray, add the Rosemary scented pork chops complete with oils and lemon halves and bind all the ingredients together with your hands. Once everything is coated, you put it in the oven for 45 minutes of so and you have a very satisfying Sunday dinner dish. We do not eat a huge amount of pork in our house, mainly because until now the kids teeth have not really been up to chewing a tougher meat and also I dont find the smell too appealing. I love the taste but find the roast pork smell a bit overpowering. 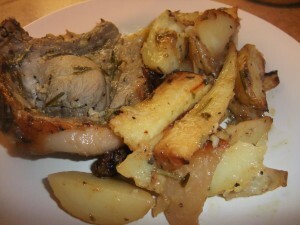 This dish did have that distinctive pork aroma, however the lemon and Rosemary marinade did diminish this significantly. I also find Parnsips sometimes difficult to eat as they have a strange metallic aftertaste, no matter how they are cooked in my experience. My husband is not a fan either. The sweetness of the Pears helped here and all of us ate them with my son being the exception. This was a satisfying dish for a cold day and extremely easy to put together. The fact that my children also enjoyed it made it an even more worthy dish to repeat. Kiddie Version: I did not have to do much mucking around with this to make this child friendly. I took one of the thicker chops so the meat would be softer in the middle. I sliced the meat off the bone and removed the fat. I think Pork has a tendency to dry a little when roasting so I chopped this into 1 inch cubes and put them back in the roasting tray and basted the cubes with the lemon scented oils. I served this with my Aromatic Garlic Rice for the children. I did give both my children a bit of each fruit and vegetable to try. Mia did eat the softer and less crispy parsnips and Ethan ate the potato, but surprisingly neither fancied the roasted pears.